If you want to peek under the hood of Tyler Hurd’s imagination, just don a pair of VR goggles and dive into his latest VR experience, Chocolate, which transforms you into a robot with cat launchers for hands, surrounded by waves of luminescent landscapes and giant-sized champagne-popping big poppa cats. Like Tyler’s previous acclaimed virtual reality creation Old Friend for the eponymous Future Islands song, Chocolate is an interactive music experience — this time set to tune of Bay Area artist Giraffage’s song of the same name. When I sat down with Tyler for the latest episode of Making Ways, my podcast all about the unexpected paths to a creative career, we talked about his passion for music and how it informs the sensory-charged experiences he creates, the origin story of his breakout “flattie” turned VR staple, BUTTS, and his near-decade-long run at San Francisco’s Double Fine Productions. Tyler’s story is an inspiring one, so tune in to learn more about how he went from a Toy Story-loving kid to a VR pioneer. One of the most helpful takeaways I gleaned from Tyler’s story is his “just start” mentality, which pushed him to leave advertising behind and embark on what has been the happiest, most fulfilling part of his career so far. Without further ado, here is how a “just start” outlook ignited Tyler’s career and creativity — and why you should consider just starting a project of your own too. Tyler left a comfortable job at renowned video game studio Double Fine Productions to pursue a career making music videos and short films in New York City, but the grim reality of that path became abundantly clear rather quickly. “My main goal [when I moved to NYC] was to make my own stuff, not to work in advertising, and. . .I was really pumped to work on these really cool short films and music videos that I had seen. But then I got out there, and people were like, ‘What? You can’t do that. There’s no money in that.’ So it was a little bit of an eye-opener when I arrived and found out my dream was a little further away then I thought.” To make a living, Tyler took up commercial character design and animation, working for a handful of advertising firms in the city, but the work left something to be desired. Although he didn’t realize it that night, Tyler’s decision to “just start” working on his project echoed a piece of advice he received before leaving San Francisco for New York City. He had yearned to pursue his own projects but was immobilized by challenges real and imagined. He recalled, “I had these ideas for projects that were not video games, and the advice was, ‘You’ve got a lot of reasons why you aren’t doing this, but why don’t you just start. . .and see what happens. There are always ways to get around all these things that you are worried about.’” While he didn’t put it into practice right away, this advice was exactly what Tyler needed that fateful night in New York to move past his fears and get to work. Once he got started on BUTTS, the project built momentum and eventually went virtual. 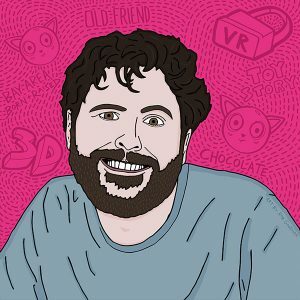 While BUTTS started out as a “flattie” (anything on a screen that isn’t VR), Patrick Hackett and Drew Skillman, Tyler’s old coworkers from Double Fine who had started their own VR prototyping and development shop (and the creators of Tilt Brush, later acquired by Google), encouraged Tyler to port his short film into an immersive world. Tyler agreed, mostly because he wanted to learn the game engine software Unity, and created assets for Patrick and Drew. They began showing Tyler’s work around in San Francisco, but Tyler still hadn’t actually seen his creation in VR. Months later, Tyler finally got his hands on an Oculus DK2 and saw his characters in VR. “When I got to see these characters that I had spent so many hours just looking at on a screen, it was like they were alive, physical things in front of me. I kind of freaked out as an animator: ‘I can bring things to life and they’ll actually be alive and look at me in the eyes.’ So that was the thing I was most excited about at that point.” Inspired, Tyler put his other pursuits on hold and went all in on virtual reality. Following his personal joy is paying off well for Tyler. His work continues to draw critical praise and win esteemed awards. But most importantly, it brings smiles to countless faces — offering a break from the stress of daily life (and maybe from those less-than-perfect jobs too) to celebrate the absurd, to dance, and to giggle. So don’t let your own insecurities limit you. At worst you faceplant and live to fight another day; at best you go on to, in Tyler’s case, one day win Best Animation at the Kaleidoscope World Tour. Whether you are pursuing a career in virtual reality or simply want to escape a mundane 9-to-5 to pursue what you love doing: Just. Get. Started. And if it’s VR that you crave, UploadVR even offers introductory courses to kick you into gear. Chocolate was made with support from Viacom NEXT, Old Friend presented by Wevr, and to learn more about Tyler’s work, visit www.tylerhurd.com. Be sure to subscribe to Making Ways on iTunes and SoundCloud, and find out more at www.makingways.co.